It was probably not an act of genius that inspired the organizers of the first Earth Day in 1970 to choose April as the time to celebrate the planet and lobby for its environmental protection. It is easy to love the Earth in spring: cheery birdsong fills the air as flocks of robins hop after worms in the greening grass, early blooms emerge, leaf buds swell and open, and fiddleheads unfurl from the damp ground, reaching for the strengthening sun. Spring offers a sense of hope. It is a time – for people and nature – to brush off the dust and dullness of winter and start anew. Earth Day began as a grassroots environmental demonstration that led to the passing of the Clean Air and Clean Water acts. Now, 42 years later, April 22 is both a celebration of steps made to protect the environment and a reminder that – in an era of over-packaged, over-processed consumerism – there is still much to be done. I have read two articles this week about the importance of outdoor experiences. One indicated that children who play in the dirt develop stronger immune systems. The other revealed that kids who are involved in nature-based activities at a very young age adopt “pro-environmental behavior” as adults. Earth day is celebrated by groups ranging from preschools to large environmental organizations. Its message varies from enjoying and exploring nature to reducing pollution and enacting energy efficiency in buildings, vehicles, and businesses. At its root, Earth Day is a reminder that maintaining and protecting natural resources – air, water, wild spaces to explore – is essential not only to human life, but our psyche as well. What better time to appreciate that connection than spring, when we rush outside to savor the sweet air and sunshine? Many local communities and organizations coordinate roadside clean-ups this time of year, as melting snow banks reveal a winter’s worth of litter. Businesses offer sales on eco-friendly items. The state Fish and Game Department and Department of Environmental Services team up to host their annual Discover WILD New Hampshire Day, featuring everything from wild animals to hybrid cars. As a child of the ‘70s, I vaguely remember school discussions about saving the rainforest, and Woodsy Owl telling me to, “Give a Hoot, Don’t Pollute!” during Saturday morning cartoons. What made a more lasting impression, however, were days spent outside digging in garden dirt and playing in the sandbox, climbing mountains and swimming in clear, cool rivers, exploring the natural places just beyond the backyard and traveling to National Parks across the country with my family. 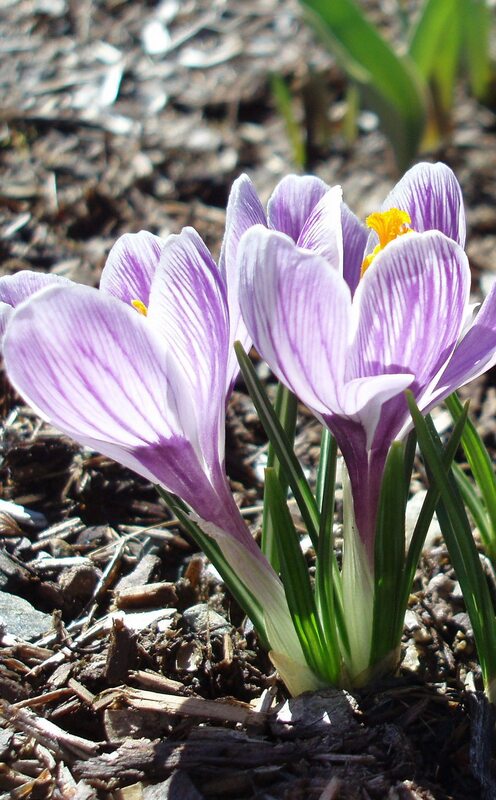 As a kid, I ran home from school on early spring days, looking for the first crocus in my mother’s garden. 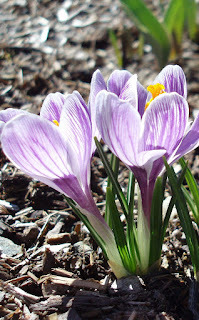 Seeing the earliest tiny, purple blossom of springtime was magical and joyful. Now I have children of my own, who love the greenness of summer, the crisp air and kaleidoscopic color of fall, the enchanting snow of winter, and the fresh blooms of spring. I’m not sure which of us – the children or I – was more excited this spring to spot the first brave crocus poking through the dirt. We all ran to it and crouched down for a closer look. Then we smiled and turned our faces to the sun, stretching toward its warmth and reaching for the promise of spring. My baby started preschool yesterday. She’s been ready for a while and could have started months ago, but she is the baby, and so I waited. 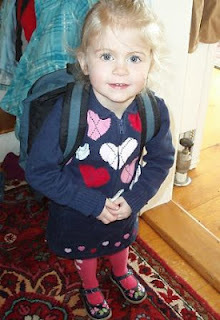 But with my parents (who watch my kids regularly) away for nearly a month and work piling up higher than the few hours each week I have to do it, I decided to bite the bullet of paying three preschool tuitions – and letting go of my baby just a little bit. My oldest children are twins, and so from nearly the moment they were born, my life became incredibly, ridiculously busy. For Ella and Owen there is rarely any such thing as quiet, alone time with Mama, and there never has been. They were born together, fed together, swaddled together, learned to walk and ride bikes and ski together, started school together, and even share a bedroom. Like any siblings, and perhaps especially twins, they are alternately best friends and stalwart rivals. With Katy things are a little different. She is in many ways the center of her brother’s and sister’s world, the doted upon little sister. And while she has older siblings to show her the ways of the world, when they are otherwise occupied, she explores that world on her own. I worked as a small-town journalist before becoming a mom. With an always unpredictable schedule that can include late nights and early mornings, it’s not a career that lends itself well to parenthood. So I gradually delved into freelance writing. Occasional work evolved into regular copy writing gigs, articles for various publications, a few odd jobs here and there, and a book. Two babies, especially for a new mom, were often simply too much to cart to the post office or grocery store, let alone to meetings or the office. Unless it was inevitable, I ran errands and worked when I was able to sneak in a couple of kid-free hours. By the time Katy came along two years after her brother and sister, I was as busy working as I wanted to be. When the “big kids” went off to Nana’s or Gaga’s house, Katy was placed in a baby sling and carried to meetings with me, or settled into the bouncy seat while I sat at the keyboard. For the past two years, on the one morning each week when it is just Katy and me, we have run our weekly errands – the grocery store, the bank, the post office. She is something of a celebrity at the Food Co-op, where she smiles coyly each week and charms the staff into giving her samples of strawberries and slices of cheese. Yesterday, I felt a bit lonely walking into the store without Katy. All the folks we normally see – Cutter in Produce, Tammy in the Deli, Carol at checkout – asked where Katy was. I finished my shopping in record time, unloaded and stored the groceries in mere minutes, and was quickly at the keyboard to work. All of that was great. But I missed my regular sidekick. She is my last baby, and while I love how grown up and smart and increasingly self-sufficient my children, at ages 5 and 3, are becoming, I sometimes feel as if they’ll go off to kindergarten next fall and college the year after. When I was a kid, I never understood why my mom seemed so perplexed by my brothers and me growing older. It seemed to take forever to get to middle school, then high school, then college. Now I know that my forever was like a blink of the eye to Mom. With three small children running my life, my days are more often than not maddeningly crazy. Sometimes it is frustrating, regularly stressful, but it’s also really fun – in a crazy sort of way. Even while I long for a quiet moment during the chaos, I know that it won’t last long, that these days when I am at the center of my kids’ world are brief. Sometimes when I think I just might scream, one of those little monsters comes over and hugs me hard, just for the heck or it, or calls out, “Mama? I love you.” How long will they do that? Not long enough, I think. Yesterday my baby started preschool. She was ready. Ella and Owen are thrilled to have their little sister at their school with them, and Katy is so happy to be there. To her, it seems like it’s taken forever to get there. To me, it feels like the blink of an eye.